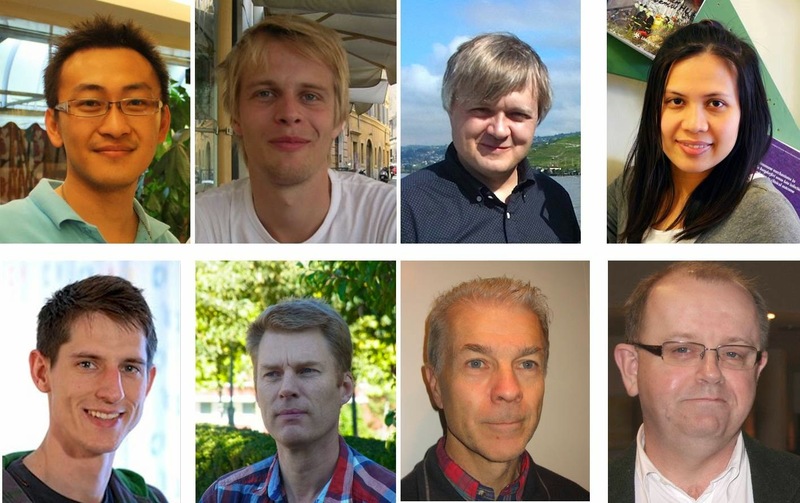 Left to Right: (top row) Chih-Wei Hsu, Anders Lundskog, K. Fredrik Karlsson, Supaluck Amloy. (bottom row) Daniel Nilsson, Urban Forsberg, Per Olof Holtz, Erik Janzén. 1Department of Physics Chemistry and Biology (IFM), Linköping University, Sweden. 2Department of Physics, Faculty of Science, Thaksin University, Phattalung, Thailand. A common requirement to realize several optoelectronic applications, e.g. liquid-crystal displays, three-dimensional visualization, (bio)-dermatology  and optical quantum computers , is the need of linearly-polarized light for their operation. For existing applications today, the generation of linearly-polarized light is obtained by passing unpolarized light through a combination of polarization selective filters and waveguides, with an inevitable efficiency loss as the result. These losses could be drastically reduced by employment of sources, which directly generate photons with desired polarization directions. Quantum dots (QDs) have validated their important role in current optoelectronic devices and they are also seen as promising as light sources for generation of “single-photons-on-demand”. Conventional QDs grown via the Stranski-Krastanov (SK) growth mode are typically randomly distributed over planar substrates and possess different degrees of anisotropies. The anisotropy in the strain field and/or the geometrical shape of each individual QD determines the polarization performance of the QD emission. Accordingly, a cumbersome post-selection of QDs with desired polarization properties among the randomly-distributed QDs is required for device integration . Consequently, an approach to obtain QDs with controlled site and polarization direction is highly desired. Figure 1. Magnified SEM images of GaN EHPs with various α. The values of α are defined as the angles between the long axis of EHPs and the underlying GaN template. 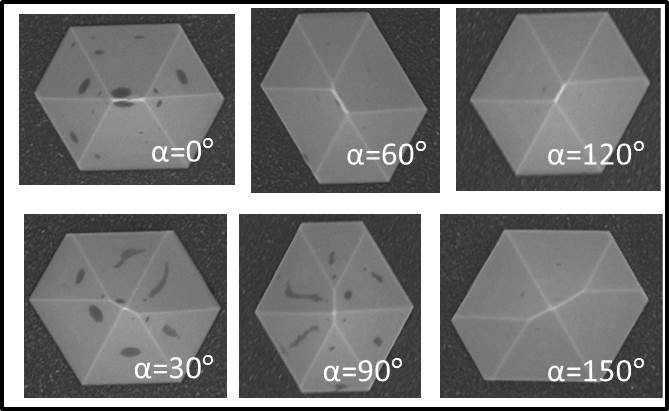 Here, we demonstrate an approach to directly generate a linearly-polarized QD emission by introducing site-controlled InGaN QDs on top of GaN-based elongated hexagonal pyramids (GaN EHPs). The polarization directions of the QD emission are demonstrated to be aligned with the orientations of the EHPs (Figure 1). The reliability and consistency for this architecture are tested by a statistical analysis of InGaN QDs grown on GaN EHP arrays with different in-plane orientations of the elongations. Details of the process and optical characterizations can be found in our resent publication . Figure 2. a) µPL spectra of EHPs with the polarization analyzer set to θmax (θmin), by which the maximum (minimum) intensity of sharp emission peaks are detected. b) Distribution histograms of measured polarization directions from the GaN EHPs for various α. 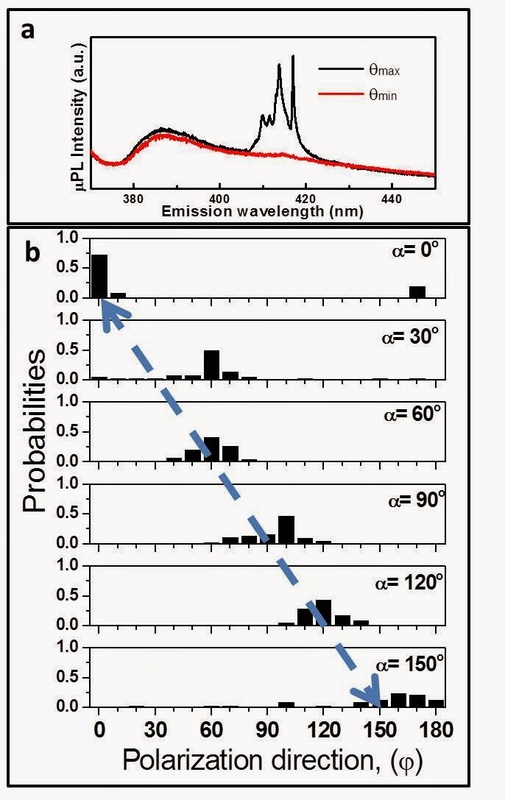 Figure 2a shows representative polarization-dependent micro-photoluminescence (µPL) spectra from a EHP measured at 4o K. A broad emission band peaking at 386 nm and several emission peaks in the range between 410 and 420 nm are observed. These sharp emission lines are originating from the multiple QDs formed on top of the GaN EHP. Despite the formation of multiple QDs on a GaN EHP, the emission peaks from all QDs tend to be linearly-polarized in the same direction as revealed in Figure 3a and all peaks have their maximum and minimum intensities in the same direction, θ. The correlation between the outcome of the polarization-resolved measurements and the orientations of GaN EHPs (as defined by α) reveals that the polarization direction is parallel to the elongation (α≅φ in Figure 2b). A polarization guiding (α≅φ) is unambiguously revealed for GaN EHPs with α = 0o, 60o and 120o. For the remaining group of GaN EHPs with α = 30o, 90o and 150o, preferential polarization directions are seemly revealed, but α≅φ is less strictly obeyed. The polarization guiding effect and the high degree of polarization are further elucidated in the following. Figure 3. a) Statistical histogram showing the overall measured degree of polarization from GaN EHPs. b) The computed degree of polarization plotted as a function of the split-off energy. The QD shape is assumed to be lens-shaped with an in-plane asymmetry of b/a= 0.8. The single particle electron (hole) eigenstates are obtained from an effective mass Schrödinger equation (with a 6 band k•p Hamiltonian), discretized by finite differences. The Hamiltonians include strain and internal electric fields originating from spontaneous and piezoelectric polarizations. The polarized optical transitions are computed by the dipole matrix elements. The polarization direction of the ground-state-related emission from the QDs reflects the axis of the in-plane anisotropy of the confining potential, concerning both strain and/or QD shape . The same polarization direction monitored for the different QDs indicates that all grown QDs possess unidirectional in-plane anisotropy. The polarization control observed in our work can be explained in three ways: (1) the GaN EHPs transfer an anisotropic biaxial strain field to the QDs resulting in the formation of elongated QDs. The direction of the strain field in the EHPs should be strongly correlated with α. (2) Given that the top parts of the GaN EHPs are fully strain relaxed, as concluded for the GaN SHPs , the asymmetry induced by a ridge will result in an anisotropic relaxation of the in-plane strain of the QDs on the ridge. The degree of relaxation is higher along the smallest dimension of the top area, i.e. along the direction perpendicular to the ridge elongation, resulting in a ground state emission of the QD being polarized in parallel with the ridge. (3) The edges of the ridges form a Schwoebel–Ehrlich barrier, which prevents adatoms of diffusing out from the (0001) facet [7,8]. Since the adatoms have larger probability to interact with an edge barrier parallel rather than orthogonal to the ridge elongation, the adatoms will preferentially diffuse parallel to the ridge. As the strain and the shape of the QDs are not independent factors and accurate structural information of the QDs is currently unavailable, the predominant factors determining the polarization is to be verified. The polarization degree of the III-Ns is more sensitive to the in-plane asymmetry compared to other semiconductor counterparts due to the significant band mixing and the identical on-axis effective masses of the A and B bands in the III-N . A statistical investigation of the value of P performed on 145 GaN EHPs reveals that 93% of the investigated GaN EHPs possess P > 0.7 with an average value of P = 0.84 (Figure 3a). The polarization of the emissions is related to the QD asymmetry determined by the anisotropy of the internal strain and electric fields, as well as by the structural shape of the QD itself . Numerical computations predict a high degree of polarization for small or moderate in-plane shape anisotropies of GaN and InGaN QDs . This is related to the intrinsic valence band structure of the III-Ns. In particular, the split-off energy has been identified as the key material parameter determining the degree of polarization for a given asymmetry. Figure 3b shows the computed degree of polarization plotted against a variation of the split-off energy. Given a fixed asymmetry of the QDs, it is concluded that the material with the smallest split-off energy exhibits the highest degree of polarization. 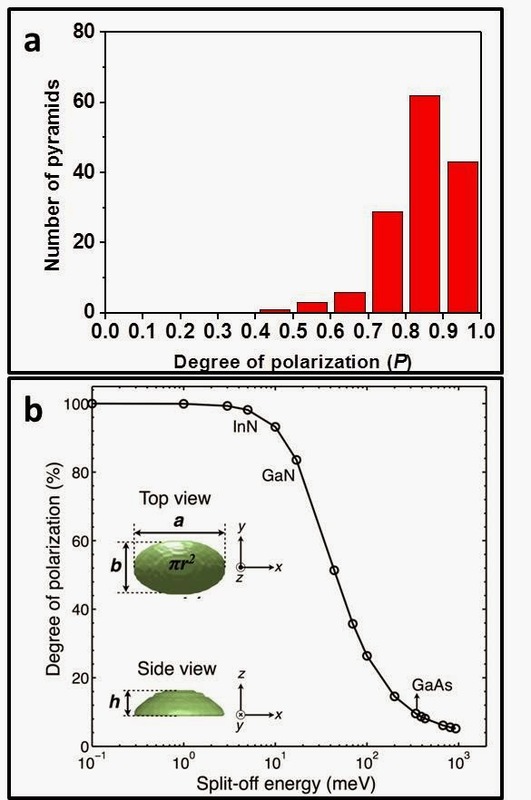 The high degree of polarization observed for InGaN QDs can be rationalized by the small split-off energies of InN and GaN, resulting in an extreme sensitivity to the asymmetry. Such a characteristic implies its inherent advantage for the generation of photons possessing a specific polarization. In summary, we have demonstrated an effective method to achieve site-controlled QDs emitting linearly-polarized emission with controlled polarization directions by growing InGaN QDs on top of elongated GaN pyramids in a MOCVD (metal organic chemical vapor deposition) system. The polarization directions of the QD emission can be guided by the orientations of the underlying elongated GaN pyramids. Such an effect can be realized as the elongated GaN pyramids provide additional in-plane confinement for the InGaN QDs implanting unidirectional in-plane anisotropy into the QDs, which subsequently emit photons linearly-polarized along the elongated direction of the GaN EHPs. Zeng Nan, Jiang Xiaoyu, Gao Qiang, He Yonghong, Ma Hui, "Linear polarization difference imaging and its potential applications". Applied Optics, 48, 6734-6739 (2009). Abstract. E. Knill, R. Laflamme, G.J. Milburn, "A scheme for efficient quantum computation with linear optics". Nature, 409, 46-52 (2001). Abstract. Robert J. Young, D.J.P. Ellis, R.M. Stevenson, Anthony J. Bennett, "Quantum-dot sources for single photons and entangled photon pairs". Proceedings of the IEEE, 95, 1805–1814 (2007). Abstract. Anders Lundskog, Chih-Wei Hsu, K Fredrik Karlsson, Supaluck Amloy, Daniel Nilsson, Urban Forsberg, Per Olof Holtz, Erik Janzén, "Direct generation of linearly-polarized photon emission with designated orientations from site-controlled InGaN quantum dots". Light: Science & Applications 3, e139 (2014). Full Article. R. Bardoux, T. Guillet, B. Gil, P. Lefebvre, T. Bretagnon, T. Taliercio, S. Rousset, F. Semond, "Polarized emission from GaN/AlN quantum dots: single-dot spectroscopy and symmetry-based theory". Physical Review B, 77, 235315 (2008). Abstract. Q.K.K. Liu, A. Hoffmann, H. Siegle, A. Kaschner, C. Thomsen, J. Christen, F. Bertram, "Stress analysis of selective epitaxial growth of GaN". Applied Physics Letters, 74, 3122-3124 (1999). Abstract. O. Pierre-Louis, M.R. D’Orsogna, T.L. Einstein, "Edge diffusion during growth: The kink Schwoebel-Erhlich effect and resulting instabilities". Physical Review Letters, 82, 3661-3664 (1999). Abstract. S.J. Liu, E.G. Wang, C.H. Woo, Hanchen Huang, "Three-dimensional Schwoebel–Ehrlich barrier". Journal of Computer-Aided Materials Design, 7, 195–201 (2001). Abstract. S. Amloy, K.F. Karlsson, T.G. Andersson, P.O. Holtz, "On the polarized emission from exciton complexes in GaN quantum dots". Applied Physics Letters, 100, 021901 (2012). Abstract.